Many operating systems and programming languages contain sorting functions. Do you rely on the sort verb that comes with your platform or application? If so, are you satisfied with its performance and flexibility? Have you wondered if a more powerful sort could simply "plug into" and "play" in your current environment? Or perhaps you are relying on mainframe JCL steps that copy, sort, merge, select, sum, or on ICETOOL reporting operations that need to work on Unix, Linux or Windows. These mainframe (z/OS) MVS and VSE JCL parms are cryptic, functionally limited, incompatible with, and not extensible on open systems. The challenge in either case is to find the closest replacement, or the most seamless migration available. You also need the fastest possible runtimes, precisely the same output results, a reliable vendor dedicated to the success of your transition and production operations, and a platform that modernizes and delivers related data transformation, reporting, conversion, and security options at the same time. IRI has continually developed, delivered, and improved sorting and sort migration technologies for open systems platforms. 40 years of innovative performance and functional development on open systems means faster production of the same results, and new metadata for concurrent data transformation, migration, protection, and reporting. 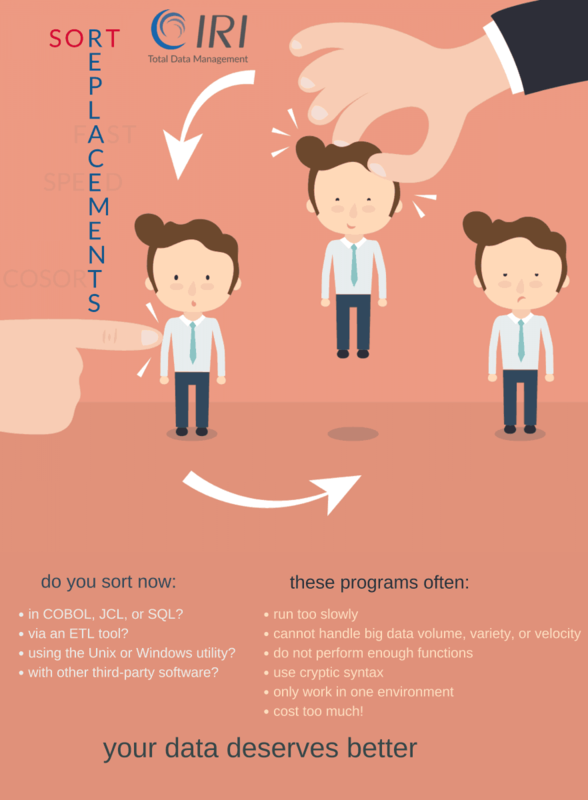 IRI CoSort includes free, automated sort job converters for z/OS MVS and VSE sort parms. These utilities successfully upgrade many third-party sort functions, and translate JCL parms to functionally equivalent CoSort Sort Control Language (SortCL) programs. Another exciting option is through proxy coupling technology from Proxmial Systems Corporation (PSC), wherein CoSort (called PSCsort in that case) jobs run seamlessly from DF-SORT parms in z/OS, but operate in the z/Linux IFL automatically. Along with either offloading method, CoSort provides a full range data transformation, reporting, protection, and prototyping functionality. Consider all the other functions SortCL performs at no additional cost. They use CoSort to convert and modernize legacy sorts and data.